I finally finished this map, it's a two to five player snow map. It has a decent amount of tiberium, the AI played well on my match with Bittah. (We against two level 2 AI's) Please post some full reviews and notifiy me of things I can improve and bugs. You'll find the credit list in the zipped file. Enjoy! The mega preview doesn't look as good as the map. Ok, It's always nice to hear that someone likes my map, however I'd like a full review, comments or your personal opinion of what you think I can improve. So it'd be very cool if you commented the map. Hmm...the blue lightning on the rivers look dumb, you don't think water creates blue light, right? Remove that. The river is blue and should create a blue-ish look around itself, it does look too intense on the megamap, I know. 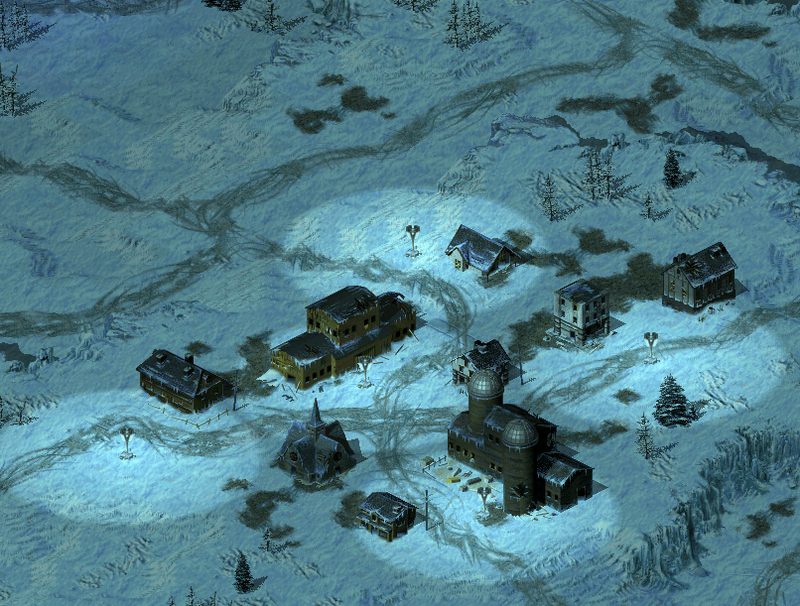 It is a nice map, very nice for a snow map. My suggestion with the blue light on the water, is to reduce the intensity of the blue light you use in the rules of the map. Its a nice touch, but as pointed out, its too intense at the moment. Also, I feel a little more lighting else where could be good to give a bit more depth to the map. This is not an edited randomly generated map? Because the design reminds me of one. No, it isn't. It's made from scratch. no j4m3s this is not a Edited Map generated map. I watched him progress on this map. anyways I agree with Muldrake that on that big preview the blue on the river areas is a little too much. Though I still have to play it in-game. Also I agree with him about that there could be some more areas of lighting on the map. I think maybe if you had some small villages spread across the map that would do it. The way you used and connected the dirt roads in this is very good. Keep up the good work. I will try to get an in-game review either today or tomorrow. Thanks for the replies guys, any more comments or full reviews? They are appreciated a lot. The blue on the water looks less intense ingame, I also did a final modification on the blue light after making the screens and megamap, I lowered the intensity from 0.35 to 0.25. @j4m3sb0nd: No, this isn't an RMG map, if you think the cliff in the middle looks like, you're right. I started this map from scratch myself many weeks ago.